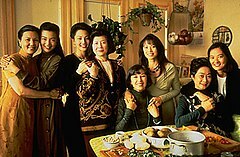 The Joy Luck Club (simplified Chinese: 喜福会; traditional Chinese: 喜福會; pinyin: Xǐ Fú Huì) is a 1993 American drama film about the relationships between Chinese-American women and their Chinese immigrant mothers. It was directed by Wayne Wang and stars Tsai Chin, Kieu Chinh, Lisa Lu, France Nuyen, Rosalind Chao, Lauren Tom, Tamlyn Tomita, and Ming-Na Wen. The film is based on the eponymous 1989 novel by Amy Tan, who co-wrote the screenplay with Ronald Bass. The film was produced by Bass, Tan, Wang and Patrick Markey while Oliver Stone served as an executive producer. Four older women, all Chinese immigrants living in San Francisco, meet regularly to play mahjong, eat, and tell stories. Each of these women has an adult Chinese-American daughter. The film reveals the hidden pasts of the older women and their daughters and how their lives are shaped by the clash of Chinese and American cultures as they strive to understand their family bonds and one another. Development of the project began when Wang approached Tan in 1989 at the time of the novel's release. Concerned about the novel's complex storytelling and character development, they teamed up with Bass in January 1990, who added a farewell party not in the original novel and voice-overs to compress the film's storytelling without changing the main plot. Carolco Pictures initially supported the project until 1990, when the filmmakers turned down the contract for not receiving the creative control that they demanded. After the first draft was written between August and November 1991, the filmmakers shifted to Hollywood Pictures in spring 1992. Principal photography took place in San Francisco, the novel and the film's main setting, in October 1992 and then in China in February 1993; filming ended in March 1993. The film was privately screened in sneak previews in spring 1993 and film festivals in August and September 1993. It premiered in Los Angeles, New York City, and San Francisco on September 8, 1993. With the film's $10.5 million budget, it was moderately successful in the box office, earning $33 M in the United States. It received positive critical reaction but also criticism for its negative portrayal of Asian American male characters. The Joy Luck Club was formed by four women in San Francisco: Lindo Jong (Tsai Chin), Ying-Ying St. Clair (France Nuyen), An-Mei Hsu (Lisa Lu), and Suyuan Woo (Kieu Chinh). The members have mainly played mahjong and told each other's stories over the years. They emigrated from their native country, China, remarried, and gave birth to children in America. Suyuan's daughter June (Ming-Na Wen) replaced her when Suyuan died four months before the time the film is set. The mothers have high hopes for their daughters' success, but the daughters struggle through "anxieties, feelings of inadequacy, and failures." Throughout the film, the mothers and daughters bond by learning to understand each other and by overcoming their conflicts. The film begins with June's prologue tale. In the prologue, a woman (presumably Suyuan) bought a swan in China from a market vendor who was selling it as "a duck that stretched its neck [to become] a goose." She kept it as her pet and brought it to the United States. When the immigration officials took it away from her, she plucked out only a swan feather instead while she struggled to grab the swan away. For a long time, the woman had kept the feather, planning to someday give the feather to her daughter. Then the film transits to June's farewell surprise party in San Francisco for her upcoming reunion with her long-lost twin sisters in China. Among the guests are members of The Joy Luck Club, their daughters, other relatives, and friends. The following characters below narrate their journeys to the audience while they reflect upon their pasts. In China, four-year-old Lindo (Ying Wu) is arranged, by her mother (Xi Meijuan) and the matchmaker (Hsu Ying Li), to be married to Mrs Huang's son when she grows up. When Lindo turns fifteen (Irene Ng), her mother sends her to Mrs Huang, so Lindo marries Huang's son, Tyan Hu (William Gong), a pre-pubescent boy who has no interest in her. After four years of childless and loveless marriage, Lindo eavesdrops on the servant girl telling her lover that she is pregnant, so he willfully abandons her. Lindo realizes her chance to leave the marriage without dishonouring herself, her family and her in-laws. Later, Lindo purportedly ruins her clothes and then claims that she had a nightmare in which Tyan Hu's ancestors threatened to punish her, Tyan Hu and the matchmaker. Then Lindo claims that the ancestors impregnated the servant girl with Tyan Hu's child and that her own marriage to him is considered offensive to them. Mrs Huang does not believe Lindo until Mrs Huang quickly discovers the servant's pregnancy through inspection. Finally, Lindo claims that the matchmaker intentionally and wrongly paired Lindo and Tyan Hu for more money. Furious, Mrs Huang orders the matchmaker out of her family's life, allowing the servant girl to have her marriage. Lindo ably leaves the house and then moves to Shanghai. Years later in America, Lindo has a new husband, a son, and a daughter named Waverly (Tamlyn Tomita). Aged between six and nine, Waverly (Mai Vu) has become a chess champion. Annoyed by Lindo using Waverly to "show off" at the streets, Waverly shouts at her mother and decides to quit chess. When she tries to play it again, Waverly loses one chess round, prompting her to retire from chess. Years later, she has a daughter Shoshana from her Chinese ex-husband and is going to marry a Caucasian fiancé, Rich (Christopher Rich), much to Lindo's chagrin. In order to make Lindo like Rich, Waverly brings him to a family dinner, but he fails to impress them especially by improperly using chopsticks and insulting Lindo's cooking by marinating the dish with a sauce, humiliating Waverly. While driving home, Waverly tells Rich how humiliated she and her family are with him, prompting him to properly learn the Chinese table manners. A while later, at the hair salon, Lindo retells her moments with her own mother and declares that she likes Rich very much. She then gives marital blessings to Waverly and Rich, prompting her and Waverly to reconcile with each other. At June's farewell party, Rich almost successfully uses a chopstick (but accidentally drops a piece), impressing Lindo by trying to respect the Chinese table manners. In China, Ying-Ying St. Clair was happily married to Lin-Xiao (Russell Wong) with a baby boy in China until Lin-Xiao abuses her and abandons her for an opera singer. Overwhelmed by her depression, Ying-Ying drowns their baby son in the bathtub as an act of vengeance against her husband, which immediately horrifies and haunts her ever afterwards. Years later, she has emigrated to America and suffers from trauma of her past, worrying her new family, including her daughter Lena (Lauren Tom). After Ying-Ying finally resolved her years of trauma, Lena shows Ying-Ying around her new apartment with her husband Harold (Michael Paul Chan), who is also Lena's boss. Ying-Ying learns that Lena is uncomfortable with her financial arrangements with Harold. They split the costs of their life evenly with a list of things that they share, making their home life contentious. Seeing that Lena is unhappy with her marriage, Ying-Ying reasserts herself by knocking over a table in the bedroom and causing the vase to fall from the table and break. Hearing the sudden noise, Lena goes to her mother and admits her unhappiness. Ying-Ying replies that Lena should leave and not come back until Harold gives her what she wants. At June's farewell party, Lena is shown to have a new vibrant fiancé, who has given Lena what she wants and is accepting of Ying-Ying. Nine-year-old An-Mei Hsu (Yi Ding) has been raised with her relatives and grandmother. She is reunited with her long-lost mother (Vivian Wu), who was disowned by her family for her "dalliance" with a wealthy middle-aged man Wu-Tsing (Wu Tianming) shortly after her husband's death, and who arrives to see her dying mother (Lucille Soong). In order to not lose her again, An-Mei moves out with her mother to Wu-Tsing's house against her relatives' wishes for her to remain with them. They claim that in allowing An-Mei live with her and Wu-Tsing, the mother will ruin her future. She finds that Wu-Tsing has three other wives, making An-Mei's mother the Fourth Wife. Later, she learns that the Second Wife (Elizabeth Sung) tricked An-Mei's mother into being raped and impregnated by Wu-Tsing. When the relatives did not believe An-Mei's mother and kicked her out, she reluctantly became Wu-Tsing's Fourth Wife as she had nowhere else to turn. After An-Mei's mother gave birth to a boy, the Second Wife took him away from her and claimed him as her own. After An-Mei discovers the past, her mother ultimately commits suicide by eating "sticky rice balls" laced with opium, choosing the day of her death carefully to threaten Wu-Tsing with the vengeance of her angry ghost. Afraid of this curse, Wu-Tsing vows to raise An-Mei and her half-brother with great care and promises to honor their mother as an honorable first wife. When Second Wife tries to pay respects to An-Mei's late mother, An-Mei screams at the Second Wife, destroys the Second Wife's faux pearl necklace (the Second Wife initially tried to win An-Mei over with a similar necklace), and loudly yells out "Mama!" Years later in America, An-Mei's daughter Rose (Rosalind Chao) has been dating her boyfriend, Ted Jordan (Andrew McCarthy) since college. Ted is initially attracted to Rose's assertive, forthright nature. When he confronts his aristocratic mother (Diane Baker) for insulting Rose due to her race, Rose is impressed and agrees to marry him. Over the course of their marriage, however, Rose and Ted become distant from each other, mainly because Rose, desperate to prove herself to Ted's milieu, becomes submissive and demure at the cost of her own identity and interests. They have a daughter, Jennifer, but this does not resolve their marital problems. To make matters worse, Ted cheats on her with another woman and neither are actually happy in their marriage. A while later, An-Mei comes for a visit and relays the story of her own mother's fate to Rose. She encourages Rose to stand up for herself and Jennifer against Ted, or nothing will change. To avoid the same fate, Rose reclaims her strength and stands up to Ted by telling him to leave the house and not take their daughter away from her. This compels Ted to take her seriously and not continue taking her for granted. At June's farewell party, it is revealed the couple reconciled. In World War II, when the Japanese invaded China, Suyuan Woo escaped the invasion with her twin baby daughters. When Suyuan became ill during her quest for refuge, her cart breaks down, causing the babies to fall. Near death, Suyuan was unable to carry the babies herself and abandoned them along with all of her other possessions, including a photo of herself. Suyuan survived, but was haunted by guilt in the loss of her daughters and never knew what happened to them. After she remarried in America, Suyuan has high hopes for her new daughter June, but June constantly fails to meet her expectations out of a lack of interest. She performs badly during a piano recital at age nine (Melanie Chang), and when Suyuan pushes her to continue training to be a concert pianist, June refuses, saying that she wishes herself dead like Suyuan's other daughters, an action that offends Suyuan. When June grows into adulthood, at a dinner party a year before Suyuan's passing, Waverly, June's long-time rival whom she is freelancing for, turns down her business ideas, and Suyuan remarks that Waverly and June are not alike, and that style is something one's born with and cannot be taught implying Waverly has style. June feels humiliated, believing her mother had betrayed her for being a failure in her eyes, and Lindo shows sympathy for June. The following day, June berates Suyuan for her remarks and admits she could never live up to her high expectations. June laments that Suyuan has always been disappointed in June because June dropped out of college, is not married, and has an unsuccessful career. However, Suyuan gives her a jade necklace and assures June that she is the one who has the unteachable style and that while Waverly was the best in competitions, June always had the best heart, which made her mother prouder than she would have been otherwise. Last Easter before the farewell party, June received the news from the Club that the long-lost twins were alive. When June could not understand the twins' letter written in Chinese, Lindo purportedly mistranslated the letter to make June believe that the twins knew about Suyuan's death and their long-lost half-sister June. Back to the present, when the farewell party ends, Lindo confesses that she wrote letters to the twins and then signed Suyuan's name. June begs Lindo to tell them the truth, but Lindo tells her that it is too late because the twin sisters are anticipating their mother, Suyuan, still believing that Suyuan is alive. A short while later, June's father (Chao-Li Chi) retells the war story of Suyuan and her long-lost twin daughters. Then he gives her the swan feather, which came from Suyuan's—the woman's—swan as explained earlier in the prologue, saying that the feather looks worthless but has "good intentions." When she arrives in China to meet her sisters, June tells them the truth about Suyuan and embraces them. In finally accepting her Chinese heritage, June is able to make peace with her deceased mother. Before The Joy Luck Club, cast members Tom and Wen were relatively unknown to American audiences. Amy Tan and Academy Award winner Ronald Bass wrote the film adaptation. Wayne Wang, who made prior films about Chinese Americans, such as his first film Chan Is Missing, was the director. Wang, Tan, Bass, and Patrick Markey were the producers. Oliver Stone and Janet Yang were the executive producers. The production designer was Don Burt. Maysie Hoy was the film editor. When the novel The Joy Luck Club was released in 1989, Wayne Wang approached Amy Tan, the novel's author, with the idea of adapting the novel that he admired into a film. Wang and Tan grew concerned about transforming it into a film, and Wang was almost reluctant to make another film about Chinese Americans since Eat a Bowl of Tea because Wang's prior films had not attracted wide audiences. There were no known Hollywood movies with an all-Asian cast at the time, and making a film with Chinese protagonists was risky especially because Asian actors were not well known to American audiences. Ronald Bass, with whom Wang and Tan teamed up since their meeting at the Hotel Bel-Air in January 1990, analyzed the novel and outlined how to bring it to the screen, with "no single lead character." Because many studios found the novel's "characters and plot [...] too internal and complex" to adapt into a film, Bass added two additional changes without changing the main plot: June Woo's farewell party as the film's timeline setting and the first-person narration in addition to voiceovers to compress the film's storytelling. A lot of executives and producers are afraid of voiceovers because they say it distances the audience from the action. I felt differently. It allowed you into the inner heart of the narrator [and] to understand their feelings in a way you could never do in dialogue. Wayne Wang, Amy Tan, and Ronald Bass teamed up with the Ixtlan Corporation, including its staff members, Oliver Stone and Janet Yang, who was the company's vice president and had a profound interest in the project. Before the project, Stone and Wang disagreed with each other about their own portrayals of Chinese people. Wang gave Stone's thriller Year of the Dragon a negative review for portraying Chinese characters as "[mobsters], gangsters, and prostitutes." Stone responded by calling Wang's Dim Sum: A Little Bit of Heart "boring" for its lack of action. Stone and Wang reconciled their differences enabling them to work together and finally agreed to produce the film together along with other producers. Carolco Pictures initially agreed to support the project in spring 1990, but the company had fiscal problems, and the filmmakers turned down the contract six months later in fall 1990 due to not receiving the level of creative control that they demanded. Therefore, Tan, Wang, and Bass outlined the screenplay themselves "in a narrative format" over three days in January 1991. Tan and Bass completed the first draft between August and November 1991. When they returned to Ixtlan on March 1992, Jeffrey Katzenberg, chairman of Walt Disney Studios, approved the project as proposed by Stone and Yang, and gave them full creative control. In spring 1992, the Hollywood Pictures agreed to assist production and distribute the film. Despite that she lacked filmmaking experience, "[Amy] Tan found the process not nearly as bad as she had feared. She was happy that collaborating meant discussions and that they were followed by time to write on her own." Janet Yang said that although several studios were interested, Disney "was the only one to step up to the line". The producers were surprised, but Yang felt in retrospect that Joy Luck "fits in with Disney's agenda—taking a chance on low-budget projects not dependent on star power". She described Disney as being "less hands-on than usual" through not being familiar with the subject matter. Filming began in San Francisco in October 1992 and then in China in February 1993. 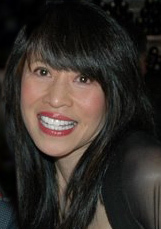 Amy Tan did not participate in the casting, even though Tan's mother, aunts, and four-year-old niece were extras in the movie, as well as Janet Yang's parents and Tan herself briefly. The filming was completed in March 1993. The film's budget totaled to $10.5–10.6 million. Hsu Ying Li (1910–1993), who portrayed the matchmaker in the film, and worked as a culture consultant on set, was killed in a car accident in Oakland, California on April 28, 1993. Therefore, the film is dedicated in her memory in the end credits. Reviews of The Joy Luck Club were generally positive. CinemaScore reported that audiences gave the film an "A+" grade. Critic Gene Siskel, singled out the script and performances, praising the film for presenting images of Asian-Americans outside the narrow range of childhood violinists and spelling bee winners, opining that its main accomplishments were its depiction of how the brutality of the lives of women in China could continue to influence the lives of their American daughters, and its ability to allow audiences to relate to a large group of Chinese-Americans as individuals. Siskel picked it as the seventh of the top ten movies of 1993, while Roger Ebert picked it as the fifth of his own top ten movies of 1993. It was voted one of the favorite films of 1993 among 1,297 readers of The Arizona Daily Star, ranked number 14 out of 253. However, when the film premiered in the United Kingdom, "some British critics found it more schmaltzy than sour-sweet." It was one of 400 nominated movies as of 1998 to be listed as part AFI's 100 Years...100 Movies, but it failed to be listed in both the 1998 list and the 2007 list. Ty Burr from Entertainment Weekly graded it a C+ and wrote that the film "covers primal issues of abandonment, infanticide, motherly love, and self-respect, pounds you with pathos [and] is extremely faithful to the novel". Burr found the story "exhausting" and preachy, he criticized the "cringingly bald, full of self-help blather" dialogue, and deemed male characters as "perfidies". However, he found the acting "generous [and] intelligent", and picked the segment of Rosalind Chao and Lisa Lu as "the only one that feels genuinely cinematic [yet] too late to save the movie". David Denby from The New Yorker called the film "a superb achievement" and praised the director's "impressive visual skills". However, Denby criticized the film writing, "[I]ts tone is relentlessly earnest, its meanings limited or wanly inspirational, and my emotions, rather than well[ed] up, remained small." Moreover, he deemed men in the film as "caricatures" and the mothers' attempts to "teach [their daughters] the lesson of self-worth" as inadequate and pretentious. Film critic Emanuel Levy graded the film a B+, calling it an "emotionally heart-rending study of generational gap–but also continuity–between Chinese mothers and their Chinese-American daughters" and a visually well-done propaganda for "cultural diversity". However, he also found it too long with "too many stories and [..] flashbacks" and too mainstream and broad to be an art film, especially when it was screened in "prestigious film festivals." Matt Hinrichs from DVD Talk rated the film four and a half stars out of five, commenting, "Despite the cultural and gender-specific nature of the story, [..] there are a lot of overriding themes explored here (such as the daughters fearing that they're repeating their moms' mistakes) that have a universal scope and appeal." Harvard Crimson writer, Allen Soong, reflected that "while the women in this film are fully fleshed-out characters who are a remarkable improvement over the "exotic Oriental" Cassandra from Wayne's World, the male characters are merely additions to the long list of negative images of Asian men in our culture." He added that "the Asian men in The Joy Luck Club, ... are either domineering and misogynist in the worst imaginable way, or they're just clueless and aloof." 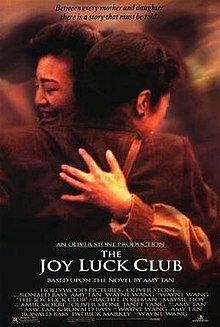 In April 1993, Amy Tan watched the rough cut of The Joy Luck Club and praised it as an emotional tear-jerker. It was thereafter screened to a bigger audience in mid-May, to an even broader audience a few weeks later, to the Asian American Journalists Association on the week of August 16, at the Telluride Film Festival on the Labor Day weekend, and at the Toronto International Film Festival in mid-September. The film opened to theatres at limited release in Los Angeles, New York City, and San Francisco on September 8, 1993. It slowly expanded to several hundred theatres by October 1 nationwide, including Salt Lake City, Utah, and St. Petersburg, Florida. It opened in some other cities on October 8, like Austin, Texas. The film earned nearly $33 million in the United States. The soundtrack was released by Hollywood Records on September 28, 1993. It was composed and produced by Rachel Portman, co-orchestrated by Portman and John Neufeld, conducted by J. A. C. Redford. Chinese instruments were used as well as Western music. Filmtracks website and Jason Ankeny from Allmusic gave the soundtrack four stars out of five. Filmtracks found the music cues not as "outstanding" as Portman's "other singular achievements in her career" but the website noted that the whole album "never becomes too repetitive to enjoy[,]" even when the music cues lack diversity from each other. The first 14 tracks were composed by Rachel Portman. The 15th and final track, "End Titles", was composed by David Arnold, Marvin Hamlisch, and Rachel Portman. The album duration is around 44 minutes. At the time the film was released, it was anticipated that Hollywood would begin to develop more films around the Asian experience, but this did not eventually happen. Flower Drum Song, released in 1961, was the first film to feature a majority Asian cast telling a contemporary Asian-American story. The Joy Luck Club (1993) was the second, a third of a century later, and the latest was released a quarter century later in 2018, Crazy Rich Asians. In the 1990s, after the success of the film, Disney Studios contacted Amy Tan to discuss making her second novel, The Kitchen God's Wife, into a film, a spiritual successor/sequel to the first; however, negotiations fell through. In the waning of the glow of Joy Luck Club, further Asian American stories were mostly shot down by studios after the brief rush following the film. In 2018, Ronald Bass, the producer of the film, revealed that a sequel is in the works, waiting to be picked up by a studio or a network. Both a TV series pilot script and a sequel feature film script has been made. The intention is to reunite the original cast for the sequel, making the film's mothers into grandmothers and daughters into mothers, with Millennial children, in a three-generation story, following the developments of the families since the original film. The setting would be 25-years after the setting of the film. ^ a b Dutka 1993, p. 1. ^ Tan, Amy (1989). The Joy Luck Club (1st ed.). New York City: G. P. Putnam's Sons. ISBN 978-0399134203. ^ "The Joy Luck Club". Turner Classic Movies. United States: Turner Broadcasting System. Retrieved 26 May 2018. ^ a b Soong, Allen (October 8, 1993). "Unaccepted Images". Harvard Crimson. Retrieved August 11, 2018. ^ Kang, Inkoo (August 17, 2018). "It's Time to Forgive The Joy Luck Club". Slate. Retrieved August 23, 2018. ^ Cho, Noah (April 24, 2014). "On The 20th Anniversary Of 'The Joy Luck Club'". HyphenMagazine. Retrieved August 23, 2018. ^ a b c d Dutka, Elaine (June 27, 1993). "A look at Hollywood and the movies: Mr. Stone, Meet Mr. Wang: The Joy Luck Club Gets Backing from a Very Unexpected Source". Los Angeles Times. Retrieved March 5, 2014. ^ Li Mark, Lindy; Li, Peter; Li, Annie D. "In Memoriam Hsu Ying Li (1910-1993)". Calisphere. University of California. Retrieved July 27, 2014. ^ "A Brief Biography of a Very Full Life". Calisphere. University of California. Retrieved July 27, 2014. ^ McClintock, Pamela (August 19, 2011). "Why CinemaScore Matters for Box Office". The Hollywood Reporter. Retrieved August 9, 2015. ^ Siskel, Gene (January 25, 1997). "The Joy of Watching 'The Joy Luck Club'". TV Guide: 18. ^ Siskel, Gene (February 14, 1997). "A culture, et cetera: Beyond Stereotypes". The Washington Times. p. A2. Record no. M00170020139. ^ "'Siskel and Ebert' Top Ten Films (1980-1998): 1993". Gene Siskel: The Official Site. Estate of Gene Siskel. Archived from the original on September 11, 2012. Retrieved March 5, 2014. ^ Greig, Jane S. (February 25, 1994). "List tops list of Siskel-Ebert". Austin American-Statesman. p. F1. Record no. AAS280292. ^ Johnson, Sheila (11 March 1994). "The tears of living dangerously: Wayne Wang called Oliver Stone's films evil; Stone called Wang's boring. The novelist Amy Tan brought them together". The Independent. ^ "AFI's 100 Years... 100 Movies (1998)". American Film Institute. ^ Burr, Ty (September 17, 1993). "Movie Review: The Joy Luck Club (1993)". Entertainment Weekly (188). ^ Denby, David (September 20, 1993). The Good Enough Mother. The New Yorker. pp. 64–65. ^ Levy, Emanuel. "Joy Luck Club, The". Emanuel Levy: Cinema 24/7. ^ Hinrichs, Matt (December 21, 2012). "The Joy Luck Club (Blu-ray)". ^ a b Means, Sean P (September 3, 1993). "Fall Films Hollywood Adapts to find an A...". The Salt Lake Tribune. p. F1. Record no. 10113706C551BD20. ^ Persall, Steve (October 1, 1993). "Courting Oscar". St. Petersburg Times. p. 19. ^ MacCambridge, Michael (September 3, 1993). "Let's Get Serious - A Preview of the Top Movies Coming this Fall". Austin American-Statesman. p. 12. Record no. AAS252660. ^ "BAFTA Film Awards: Adapted Screenplay in 1995". British Academy of Film and Television Arts. ^ "Awards for 1993". National Board of Review. Archived from the original on 2012-02-09. ^ Washburn, Lisa, ed. (January 12, 1994). "Scripter given to Schindler's List". Daily Trojan. 122 (2). University of Southern California. ^ "Joy Luck Club, The: Awards". Writers Guild Foundation. ^ "Fifteenth Annual Youth in Film Awards: 1992-1993". Young Artist Awards. ^ a b c "The Joy Luck Club review". FilmTracks. April 23, 2004. Retrieved March 5, 2014. ^ a b c Ankeny, Jason. "The Joy Luck Club [Original Soundtrack]". Allmusic. Retrieved March 5, 2014. ^ Melissa Hung (13 August 2018). "Six decades ago, 'Flower Drum Song' featured Hollywood's first Asian-American cast". NBC News. ^ Alexa Valiente (16 August 2018). "Before 'Crazy Rich Asians,' there was 'The Joy Luck Club': Cast, executive producer on the film, an all-Asian cast, 25 years later". Good Morning America. ABC News. ^ Robert Ito (8 August 2018). "'Crazy Rich Asians': Why Did It Take So Long to See a Cast Like This?". New York Times. ^ Andrew R. Chow (9 September 2018). "In 1993, 'Joy Luck Club' Changed Hollywood. Until It Didn't". New York Times. ^ "'Joy Luck Club' sequel and TV series in the works". Calgary Herald. World Entertainment News Network. 24 August 2018. ^ Scott Baumgartner (23 August 2018). "'Joy Luck Club' Producer Reveals a Sequel Script Has Been Written 25 Years Later (Exclusive)". Entertainment Tonight. Dutka, Elaine (August 31, 1993). "Joy Luck: A New Challenge in Disney's World". Los Angeles Times. Retrieved March 5, 2014. Liu, Sandra (2000). "Negotiating the Meaning of Access: Wayne Wang's Contingent Film Practice". Countervisions: Asian-American Film Criticism. Temple University Press. ISBN 1-56639-775-8. Retrieved March 5, 2014. For paperback: ISBN 1-56639-776-6. Weinraub, Bernard (September 5, 1993). "FILM: 'I Didn't Want To Do Another Chinese Movie'". The New York Times. Retrieved March 5, 2014. Tan, Amy (September 5, 1993). "COVER STORY: Joy, Luck and Hollywood". Los Angeles Times. Retrieved March 5, 2014. Loos, Pamela (2008). A Reader's Guide to Amy Tan's The Joy Luck Club. Enslow Publishers Inc. Retrieved March 5, 2014. This page was last edited on 2 April 2019, at 18:52 (UTC).